NEW YORK — Ebony Daniel didn’t expect to find herself in the situation she was in. She had just become a single mother to three young girls after losing their father to an unexpected heart attack and was living in a tiny one-room bedroom in a shelter in Queens. Daniel saw that her girls – Leilani, 12, Maliyah, 7, and Melanie, 5 – needed a change. That’s when she found out about Girl Scout Troop 6000, New York City’s first troop entirely comprised of young girls living in homeless shelters. “I was looking for something to do with them while being in the shelter. So, I was like maybe this could be good for them to get over the loss of their father,” Daniel said. 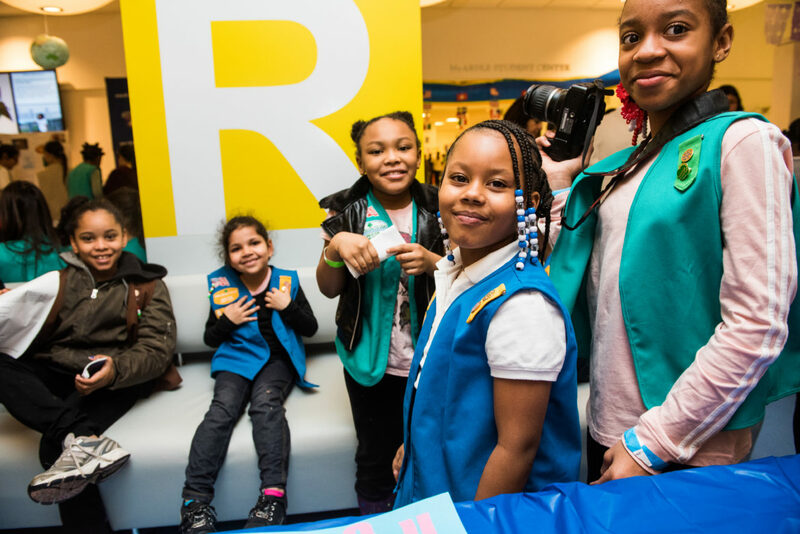 Established in 2017, Girl Scout Troop 6000 was founded by Giselle Burgess, a community liaison for the Girl Scouts of the United States of America (GSUSA). At that time, Burgess, a mother of five, found her family living in Sleep Inn, a hotel in Queens that had been turned into a shelter. She pitched the idea to the Girl Scouts of the Greater New York’s CEO Meridith Maskara and New York City’s Department of Homeless Services. They loved it. “For us as an organization, we are very committed to making sure that every girl has the opportunity, no matter whether she has a home or she doesn’t, to become a leader because we believe that every girl has a potential,” Maskara said. Within months of starting the troop, the demand to expand its services grew. Last summer, Troop 6000 added 14 additional shelters and is serving about 500 women and girls currently. Troop 6000’s story has caught the attention beyond the city’s. Last summer, Whoopi Goldberg of The View gave the scouts a $75,000 donation. The Tonight Show host Jimmy Fallon also surprised Burgess while on air and presented her with two checks, one from the show for $6,000 and one for $50,000 from JCPenney. When the troop sold a record-number of over 30,000 boxes of cookies this past spring, they saw their scouts making headlines again. Maskara hopes the national attention given to Troop 6000 will help change the perceptions of homelessness. There are nearly 60,000 homeless people in New York City living in shelters, including almost 22,000 children, according to the Department of Homeless Services. The Institute for Children, Poverty, and Homelessness (ICPH), a policy research organization based in New York City, reported that students with a history of homelessness experiences can have lasting effects that could be detrimental to their academic development. According to the 2017 study, homeless students are more likely to need additional education and language learning supports, miss more school and have a lower graduation rate than in comparison to their peers that are housed. “On the Map: The Atlas of Student Homelessness in New York City 2017.” A study by The Institute for Children, Poverty, and Homelessness. Infographic by Camille Douglas. GSUSA CEO Sylvia Acevedo said that one of the goals of Girls Scouts is to create a stable community for girls that will encourage them to learn and develop leadership skills. “We believe there is a wellspring of passion, determination and courage residing within every girl. Our organization offers a nurturing environment where she can develop skills to unleash her potential,” Acevedo said. Daniel recognizes the community the Girl Scout organization has helped create within Troop 600. She says that troop has become an outlet for her daughters to feel comfortable discussing their current living situation with the other members, something they have been too embarrassed to talk about before. Since joining the group in November, she’s already witnessed how her girls have matured, especially Leilani, her oldest. When Troop 6000 started last year, it was the first of its kind, meaning they were the first-ever Girl Scout troop to have its members be entirely comprised of girls living in shelters. Now, they are pioneers. A group in Chicago started their own similar troop back in November, Troop 25680. As for Daniel, she’s working on trying to move her family out of their shelter in Queens. In the meantime, she’s focused on her role as a troop leader for Troop 6000 and helping the group expand and develop their services to more young girls who are living in shelters.